Out of Home media operators and in-store media owners can now integrate internet of things (IoT) enabled sensors into their displays to deliver contextually relevant messages. For example, a temperature sensor can signal a content management system to prioritize an advertisement for soda on a hot day. Machine learning powers image recognition software that takes this adaptability to the next level. Advertisers have conducted campaigns in which machine learning software identifies the make and model of cars on a highway and subsequently displays ads for applicable vehicles on nearby digital billboards. Other innovators are using machine learning to identify the gender, age, and mood of those viewing digital displays and subsequently tailoring messages based on these factors. Despite these advances in the capability of digital signage to deliver dynamic and personalized impressions, overall adoption rate remains relatively low for innovative solutions, including computer vision and machine learning technologies. However as costs to deploy these technologies decrease and solutions become more flexible, we expect rapid acceleration in digital signage and related technology penetration. Though growing faster than traditional out of home media, digital signage remains fragmented by a diverse range of hardware specifications and proprietary operating systems. As a result of this fragmentation, software providers are developing their own hardware instead of deploying agile, platform-agnostic applications. For example, many content management system vendors package their software with proprietary media players designed to plug into digital screens. The wide range of hardware configurations can introduce friction in the deployment of content management systems. Furthermore, not all media players are compatible with every type of digital display, which can limit sales opportunities for content management system providers. While this fragmentation creates friction in the digital out of home market, it is the result of a large number of competitors pursuing market share in a new, rapidly expanding section of the out of home media and in-store media industries. We see significant whitespace for growth as the ecosystem matures and increasingly flexible solutions are deployed. These solutions will accelerate adoption rates for dynamic, innovative and cutting-edge digital displays. Hardware manufacturers in the industry have undertaken initiatives aimed at standardizing the system architecture between displays and pluggable media players. These initiatives take the form of hardware specifications that define standards for docking boards between media players and digital display panels. Such specifications also encourage the use of common processors in media player design, improving the interoperability of content management system software by standardizing the underlying computer architecture. These hardware specifications are optimized for commercial digital signage, interactive whiteboards, kiosks, visual data devices and video walls. By guaranteeing compatibility and interoperability between media players and displays, such specifications seek to simplify the installation, usage, maintenance, and upgrade of digital signage infrastructure. These specifications were also designed to support performance intensive tasks including interactivity, 4K resolution, and simultaneous display. Another approach the industry has taken is the development of a standard Application Program Interface (API) to facilitate communication between content management systems and System on Chip (SoC) displays. SoC displays embed the hardware necessary to play media on a digital display within the display itself. This includes a processor and memory. Approximately 80 percent of digital signage displays already implement SoC technology; however, most manufacturers combine their SoC with a proprietary operating system. For content management system vendors, building a software version for each of these operating systems is not as cost effective as building one version and packaging it with proprietary hardware in the form of a pluggable media player. For operators, the additional complexity of using different content management systems to manage screens from different manufacturers creates logistical challenges. While most displays have SoC capabilities, many remain underutilized in favor of pluggable media players. 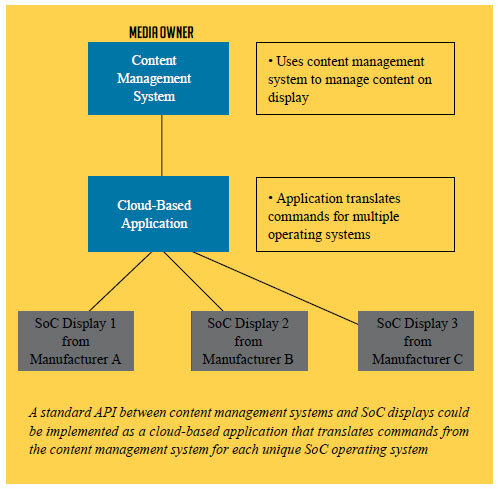 A standard API between content management systems and SoC displays could be implemented as a cloud-based application that translates commands from the content management system into commands for each unique SoC operating system. As these solutions are adopted, we expect interoperability for media owners and operators to increase dramatically. As content management systems become more operator friendly and flexible, we expect the already rapid pace of digital out of home media and in-store media penetration and innovation to further accelerate. 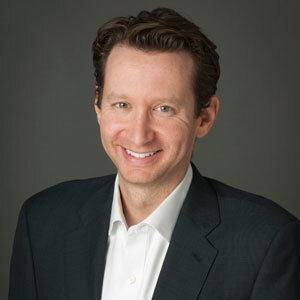 Greater interoperability of software and hardware will allow operators to make incremental updates to their digital infrastructures, “future-proofing” their investments and increasing overall media spend. As digital signage technologies mature, we expect to see out of home media and in-store media portfolios that incorporate both passive digital and cutting-edge solutions including transparent, flexible, interactive and large-format displays.